Detroit’s NFL team considers itself a citizen of the rebounding city. Its CFO is on a quest to help the team better serve its loyal fans and celebrate the shared successes of their hometown. Luis Perez, Chief Financial Officer, Detroit Lions. Photo by Sheila Barabad. Detroit’s football fans are nothing if not loyal. Although the Lions last playoff win came in 1991, the team’s supporters have kept their hope and passion alive. The franchise is inextricably linked to Motor City. And like Detroit itself, the Lions are on the verge of a rebirth. There’s a new coach, a new owner, a star-studded lineup, a quarterback in his prime, and a high-octane offensive line. And then there is the Lions’ chief financial officer (CFO) Luis Perez, who takes on much more than even his C-suite title suggests. Perez was born in Cuba, grew up in New Jersey, pursued an accounting degree, passed the exam, and started working for a large firm that served the Philadelphia Phillies. That kicked off Perez’s career in the sports arena, spanning three major leagues in which he’s developed a reputation as an outside-of-the-box thinker. Now with his second NFL franchise, Perez is leading efforts to use local vendors, eliminate paper tickets, enhance the fan experience, and promote authentic community outreach. Perez joined the Lions in 2011 as part of a front-office reboot. “Changes had started on the field, but the business side still needed to catch up,” he explains. “We needed to revamp operations to capitalize on a winning football team.” A leadership group (including prominent vice chairman William Ford, Jr.) brought in five new vice presidents and two senior vice presidents. Together, the new guard is working to change the way Lions fans interact with their team. On any given Sunday during the football season, Detroit’s Ford Field hosts around 65,000 visitors. “We’re going to make an impression,” says Perez. “The only choice we have is what that impression will be.” The Lions’ product, the fan experience, can either entice the fans to return or drive them away. Those who return may buy merchandise, visit the team website, or sign up for season tickets. But reaching individual fans is only half the battle. Perez is also targeting another overlooked crowd: the corporate client. “For years, we were just playing football without positioning ourselves with a second important subsector of our fan base. Individual fans are very loyal, but we were irrelevant to our corporate customers. We’ve changed that,” he says. Today, the Lions are providing those business partners a platform that will help them meet business objectives and drive value back to their organizations. “We’re not just selling a 30-second commercial or a single piece of signage. We’re partnering with companies and building relationships, so they can really invest in our platform,” Perez says. Lions’ sales employees interact with clients to understand their individual needs and then build a plan to help achieve specific goals from brand awareness to foot traffic. Last year, for example, the Lions helped take partner brand Unifi to new levels. The US-based global textile manufacturer that licenses to companies like Nike, Ford, and the North Face, had a previous deal with the X Games. Unifi uses recycled plastic bottles in its Repreve fabric line and is now the official sustainability partner of the Detroit Lions. Quarterback Matthew Stafford endorses the hashtag campaign #MakeASmartThrow and other efforts that educate fans on the importance of recycling while increasing awareness for Repreve. The partnership was launched during a training camp practice where Stafford replaced his red practice jersey with a lime green version, and the franchise encouraged consumers to look for brands made with Repreve. Journalists from outlets like CNN and Wall Street Journal covered the event. Whether involved in on-field or front-office work, those associated with the Lions believe the team can win the league’s NFC North conference in each of the next several seasons, and Perez and his team are hard at work to make sure the organization can capitalize in multiple ways. Like many CFOs, he oversees departments like finance and IT—but in a move that bucks tradition, he’s also managing ticket sales. In 2013, the Detroit Lions became the first NFL team to leave Ticketmaster when they signed a deal with a small operation known as Veritix. “We took this risk because we strongly believed that the way we were ticketing our product had been unchanged for way too long,” says Perez. The Lions wanted to personalize the experience and find another way to engage the fan. Veritix is more of a back-end operation, which means fans who call to order tickets deal with the team directly instead of a Ticketmaster call center. That gives the Lions another chance to manage their brand. Perhaps more importantly, the team can now track who actually uses the ticket. That information will help drive marketing strategy. “We now know exactly who is here, and we’ll soon be able to follow their behavior once they’re in the stadium,” says Perez. Furthermore, fans can access the stadium through a smartphone app, which will be integrated with the Lions’ point-of-sale system. In an accompanying move, the Lions became the first NFL team to move to variable pricing tickets, dropping preseason prices by 70 percent and charging a premium for the most popular games. While secondary ticket resellers once purchased unused Lions tickets and reaped huge profits, Perez is helping his franchise recapture that revenue. Slows Bar-B-Q is a local favorite in Detroit. One of Perez’s initiatives to make Ford Field reflect the community involved bringing in local vendors serving their novelties on site. These and other efforts appear to be working. Recently, Perez has put in motion some initiatives to make Ford Field feel more like downtown Detroit by working with food-and-beverage partner Levy Restaurants to lure iconic Motown food brands to the stadium. He’s struck deals with some of the city’s most famous restaurants, including Russell Street Deli and Slows Bar-B-Q to provide food in premium levels of the stadium. The club level now resembles main street D-town. “We’re not just decorating the stadium with brand signage,” Perez explains. “We’re actually bringing the companies here to cook and sell authentic products. 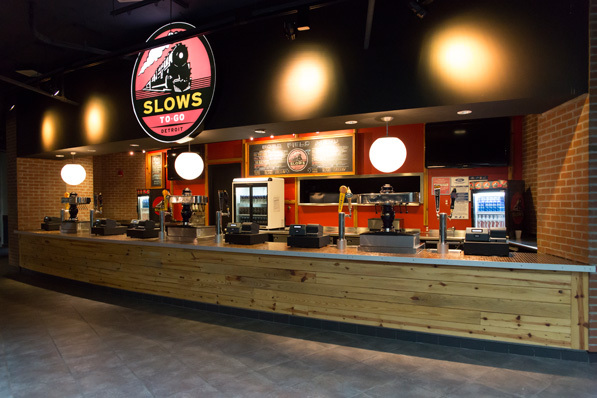 If you want Slows without the 90-minute wait, come to Ford Field.” The team is purchasing food and other items from local farmers and vendors as much as possible, even if doing so may affect profits. The Lions are in talks with Aetna, who has shown interest in sponsoring these initiatives. In addition to internal improvements, Perez knows an NFL team has a greater responsibility to its community. That’s why he’s helping the Lions make an impact outside of Ford Field. “We’ve thrown traditional sports community relations on its side,” he says. While most teams hold celebrity golf outings and write grants to partner with organizations, the Lions are finding new ways to drive impact in the places that need it the most by creating a completely different community relations endeavor. The team has hired a senior director of community relations with a background in public policy, who has helped identify three important issues affecting the city of Detroit: health and wellness, job creation, and neighborhood redevelopment. Instead of just writing checks, the Lions have identified partners already working in those three spaces. “We can bring our platform to experts already working in the community, and we can leverage our resources to help them change Detroit,” says Perez. The city has few chain grocery stores, forcing the urban poor to buy processed foods from convenience stores. The city also has Eastern Market, the country’s largest urban farmers market. The Lions hold events there and are even creating pop-up markets that will bring mini farmers markets to poor neighborhoods. Appearances by Calvin Johnson and other athletes draw media attention and families alike. Candidly, Perez shares that he had other offers on the table when he accepted the Lions job. He took the opportunity in Detroit because he wanted to be a part of something special. “When I got here, I could just tell there was something different going on,” he says. People in Detroit aren’t stuck on hardships in auto manufacturing or the economic crisis; they’re looking to the future. The Detroit Lions have been part of the city since 1934. Its fans have watched a city become the nation’s fourth-largest, rise as a center of innovation, and then experience a dramatic fall. But now, hope is starting to build again. Entrepreneurs and businesses are coming back. And through it all, one thing remains at the heart of Detroit—the Lions.